It's SRC time again! What's SRC? It's the Secret Recipe Club, where each month, we're assigned another blogger, and we get to pick a recipe from their blog to make. This month, I got Oh! You Cook!, where Dena shares recipes proving kosher and delicious aren't mutually exclusive. For this edition of the SRC, I wanted to choose something extra delicious since the Secret Recipe Club's coming to an end, and this reveal is the last one. Looking through Dena's archives, I had no problems picking a recipe. Where I ran into issues was narrowing down the selection. We weren't feeling well, so I thought about making some congee, and with my love of chai, I definitely wanted to make her chai latte oatmeal. Or course, I also saw gulab jamun, one of James' favorites. However, as we had a surprisingly warm day, I wanted something cool and refreshing. Something like a Peanut Lime Cucumber Salad. It'd been a while since we'd had some Thai flavors around here, and it was definitely time to remedy that! 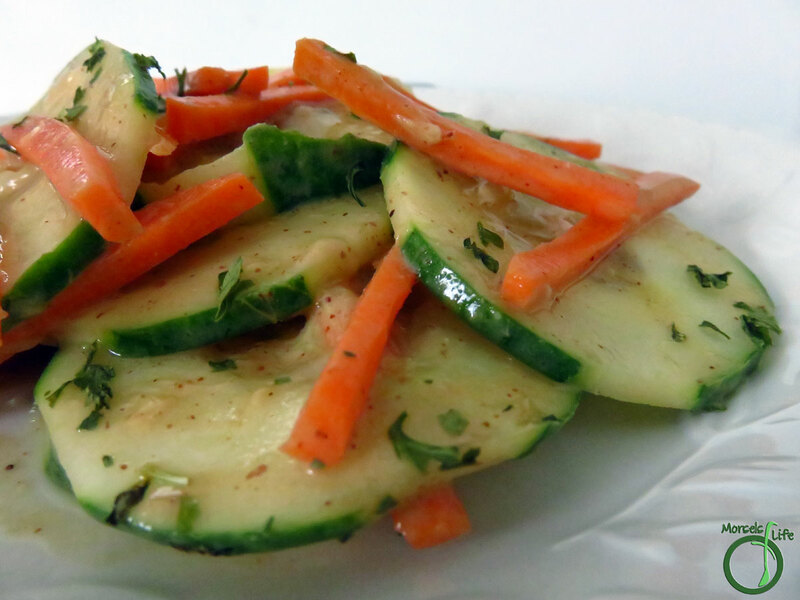 And what better way than this cool and refreshing peanut lime cucumber salad? Another plus - it's super simple - my type of recipe! 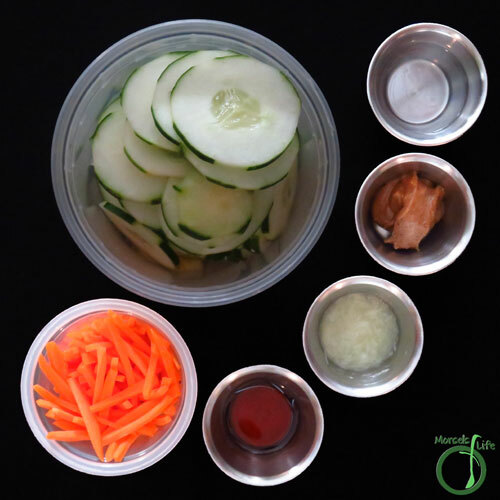 Simply whisk together your dressing, then combine all materials! YUM! 1 tablespoon water If you want a thinner sauce, you could also add more water. 351 grams 12.375 ounces 1 cucumber, thinly sliced I used 1/8 inch slices. Whisk together lime juice, peanut butter, water, sesame oil, and soy sauce. Amount of water can be adjusted for desired consistency. 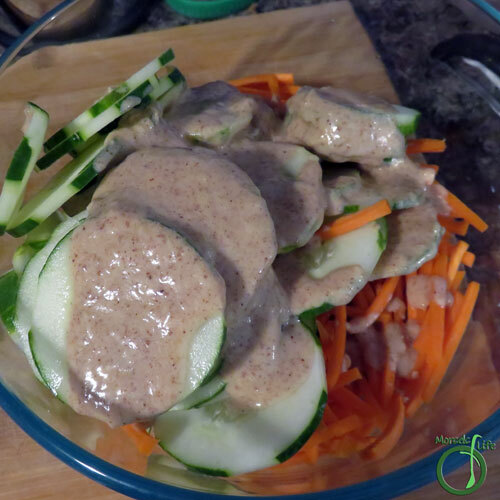 Combine sauce with cucumber mixture. Shake to coat well. 2. 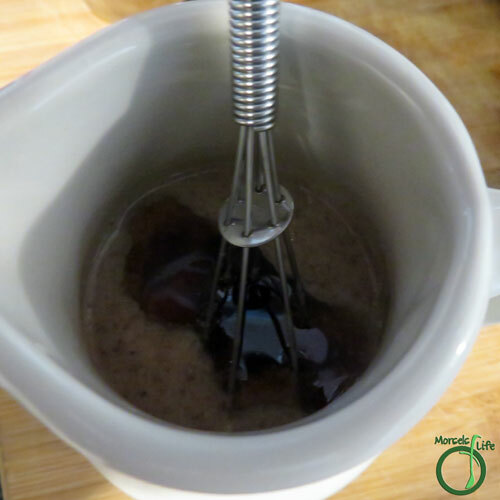 Whisk together lime juice, peanut butter, water, sesame oil, and soy sauce. Amount of water can be adjusted for desired consistency. 3. 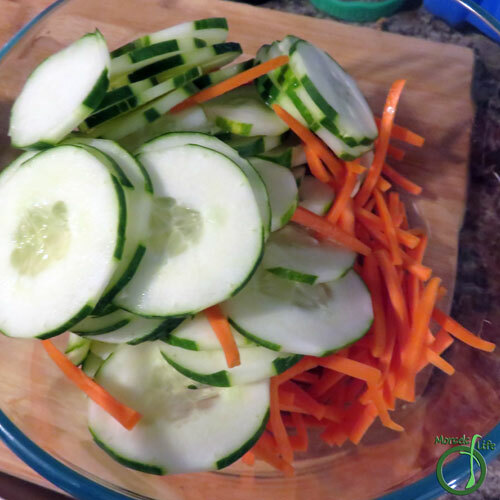 Combine cucumber and carrots. 4. Combine sauce with cucumber mixture. Shake to coat well. 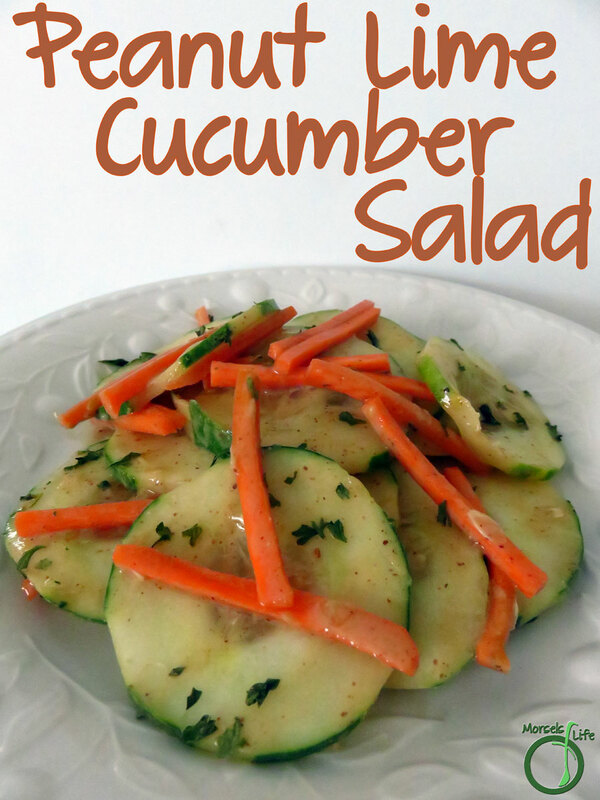 I love a simple cucumber salad and the flavours in this one are delicious! Oh I love this. What a perfect side for an Asian inspired dinner. This is one of my favorite salads ... glad you selected it for the final SRC. We loved it! So sad this is the last SRC. What a terrific side dish! This looks so fresh! 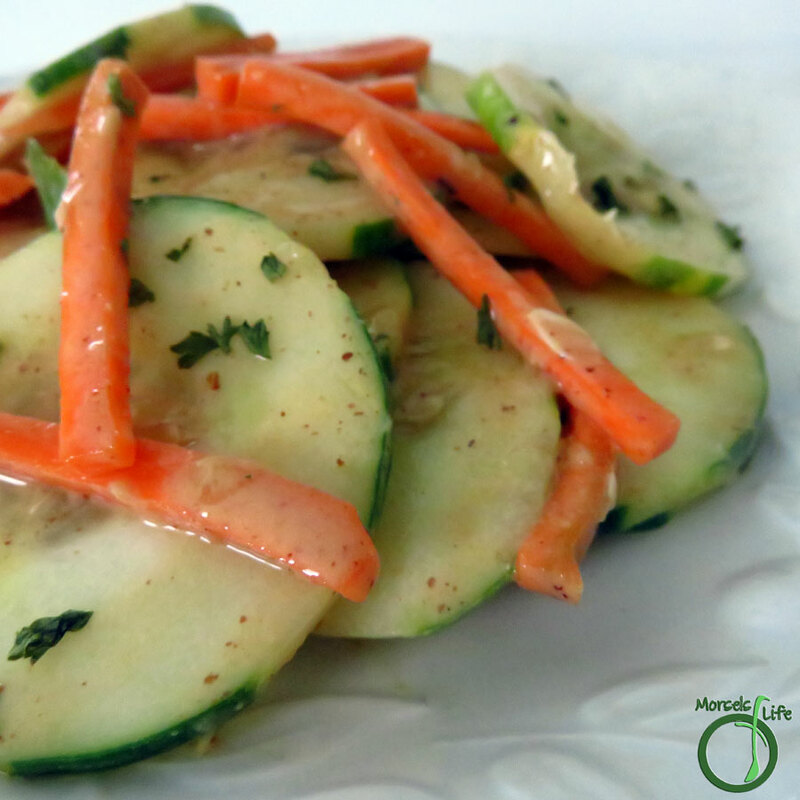 I'm always looking for new side dishes using cucumbers! I love this! Yum! I love fresh sides! This sounds delicious (perfect for Florida) and would make a great side to go with our weekly Asian flavored dinner. My version has onions, oranges and peanuts in it too. That looks really good! Thanks for sharing on the What's for Dinner Link up!